You are here: Home / Business toolkit / What are reasonable adjustments in the workplace? The right tools at work can make all the difference in helping people with disability reach their best at work. Understanding how to support your employees with disability is an important step towards optimising your organisation’s productivity and achieving positive workplace mental health. Reasonable adjustments are changes to a workplace or role to remove barriers that prevent people with disability from succeeding in their role. These adjustments may be temporary or permanent, and are designed to optimise a work process, procedure, or environment. Under the Equal Opportunity Act 2010, employers are required to make any reasonable adjustments to the workplace that will support people with disability fulfil their job role. Employers can apply for funding for workplace modification assessments through the Australian government body, Job Access. Reasonable adjustments will differ from person to person. Reasonable adjustments can include standing desks, voice recognition software, noise-cancelling headphones, communication devices, and everything in between. We recently collaborated with Brisbane City Council to create an educational video on reasonable adjustments. The video features a number of employees discussing how reasonable adjustments have helped them achieve success in their roles. For many people, the ability to access specialty equipment and support is what allows them to continue working. Carole, an Administration Officer, experienced significant sight loss eight years ago, impacting her ability to read small font sizes or paper documents. But with appropriate workplace adjustments, Carole’s transition back to work has been smooth. “I use a part screen magnifier. The keyboard is coloured yellow, which makes it a lot easier to see the keys and numbers. It’s also larger than your normal keyboard,” explains Carole. 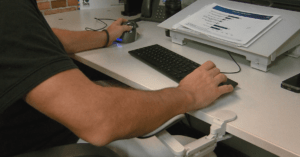 Ergonomic adjustments, such as standing desks and footrests, can alleviate pain or stress. Waste Management Officer Paul has an ongoing pain syndrome that causes constant pain in his right-hand. To help mitigate this, Brisbane City Council equipped him with a left-handed ergonomic mouse and an ergonomic wrist support. “It’s designed to literally carry my right hand so the rest of the muscles in my arm are not actually lifting it. I can sit on top of it, float across my keyboard, and it’s simple for typing,” says Paul. Reasonable adjustments don’t have to be physical. In Araminta’s case, she reduced her work hours and began occasionally working from home. “As long as you communicate, I think that’s the biggest part. As long as everybody talks to everybody else, they’re really amenable to you doing what works for you,” says Araminta. Is it difficult to access reasonable adjustments? There’s a common misconception that it’s difficult to access reasonable adjustments, but with support from Job Access’ Employment Assistance Fund, it’s easier than ever to implement simple and affordable solutions. And for workplaces and employees across Australia, that’s a game-changer. EPIC Assist can liaise with Job Access, and handle all the logistics relating to reasonable adjustments, making the process as simple as possible for you. If you’re not already connected with EPIC Assist, contact us today to implement the reasonable adjustments your staff need to succeed.